Now you can tag your Action Items and then run query using the tags. We have also added a multi-create option for Action Items using which you can create multiple Action Items in one go. In the create AI page now you can add tags. You can also use the multi create toggle button to go to the multi create page. In the multi create page you can add more rows using the plus (+) button or remove rows. 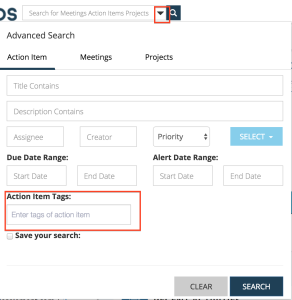 You can also add common tags, assignee, or due date for all the Action items in this page. The screenshot below shows an example of adding multiple action items using the same common tag. Finally you can run queries using the tags to find all action items with the same tag.